The promised judgment was coming soon, and it did. This chapter also looks ahead to the final judgment of Babylon in the Day of the LORD as seen in Revelation 18:2. Isaiah 12 was a comforting passage, a song of praise. Then in this chapter we get to the promise of destruction against that most unholy of cities: Babylon. I read once someone termed the Bible as a tale of Two Cities: Babylon and Jerusalem. They weren't far off. Of course, what the cities represent is what it's all about. Unholiness of Babylon, the world and its systems, and the holiness of Jerusalem, where God has set His name and soon will dwell personally. Having come to the Lord later in life, I vividly remember being inside the unholy world system and wondering why I felt uncertainty, restlessness, and fear at different times. The specter of death with the unknown beyond will definitely do that to you. In the KJV the word 'howl' made me think of Allen Ginsberg's famous poem called Howl. Its imagery burns into one's mind with a sulfur strike white hotness emblazoned like a photo negative. It's an angry poem, raging against the darkness and essentially crying out "Why is it like this? Why?" The Psalmist wrote in Psalm 2:1, Why do the heathen rage, and the people imagine a vain thing? 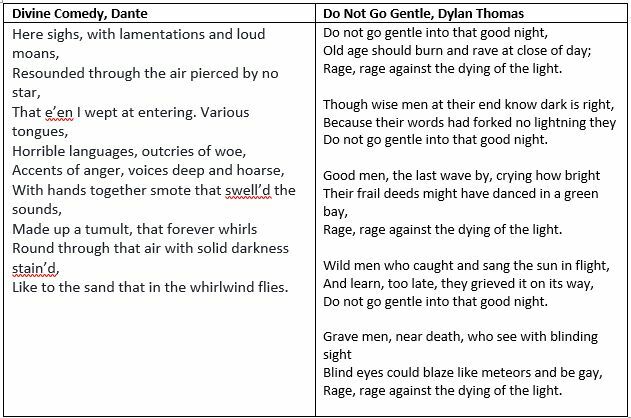 and Howl (as are so many poems) is just the pagan version of that scripture. Ginsberg said some of the imagery in the poem came from a bad peyote trip he'd taken where he saw the apartment building he was staying in morphed into the face of a child-eating demon he later called Moloch. In the Bible, there really is a child-eating demon-god named Moloch to whom the people sacrificed their children. Romans 1:18 says that the unrighteous suppress the truth. They are aware of the truth, and despite pressing it down away from consciousness, at some level they connect with it. They detect its convicting tendrils creeping upward from the polluted recesses of their heart, only to be smashed down in howling rage. 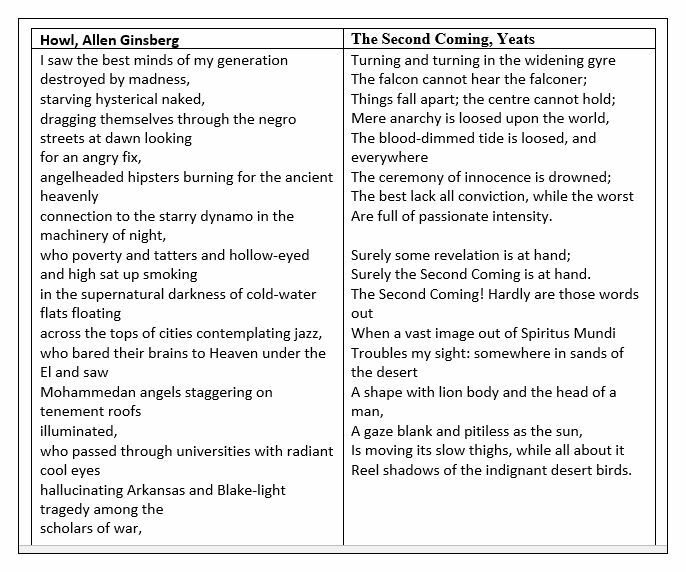 We see that in Ginsberg's Howl, and we see it in Yeats' poem The Second Coming, where Yeats used religious imagery to make his point. Yeats hadn't taken a peyote button, but he was heavily involved in occult practices such as calling up demons and channeling and seances and the like. He sought visions, and he got them. 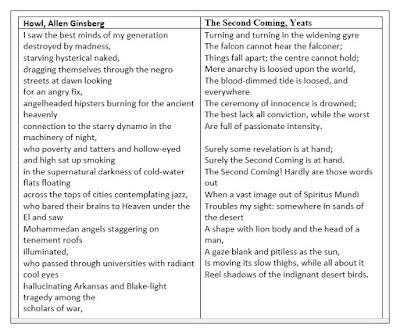 So, similar to Ginsberg, the imagery in Yeats' vision tapped the well of dark truth suppressed deep within his soul. Not comprehending it, the pagans rage. Yeats' soul seethed and stormed, you can feel that his poem is a bellow into the gaping maw of black eternity, only to be silently swallowed by a dark and depraved infinite, and in the end, his pitiful howl making no more noise than an owl's winged whisper. 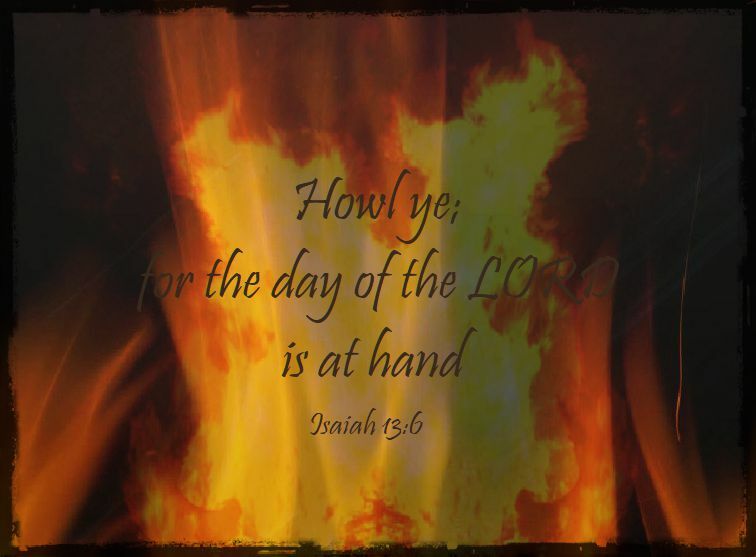 In the Isaiah passage today, the LORD promises destruction upon Babylon. Their near future and their far future contain the coming of the LORD in wrath for their unrighteous deeds. He is telling them in advance, 'Howl, for your destruction is sure!' This is the end which the pagans rail against. It is the end that all the unrighteous suppress in wickedness, but still lay coiled nasty to spring up and swallow souls whole. Howl, you Babylonians. Wail, you pagans, because justice, knife sharp and cleanly pure, will separate you from this earth with a flick. 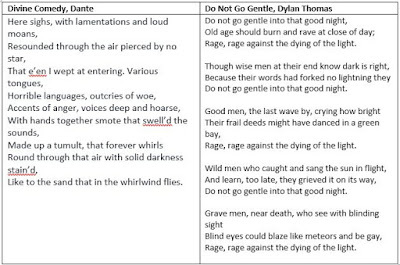 Comparing the language and imagery used in various poems. Click to enlarge.